2012 Designer, Special Projects, Brunswick Boat Group. 2011 Project Manager, 3D Modeler, Texture Artist, "Dora the Explorer", Main titles. 2011 3D Modeler, Texture Artist, Compositor, Lucky Charms "Rainbow", "Everybody Flies". 2010 Technical Consultant/Animator Calabash Animation. 2008 Instructor for Rhino, Photoshop, After Effects, MAYA, Editing, etc. 2005 Pre-viz, Prop Design, "Teenage Mutant Ninja Turtles, (3D)" Warner Bros.
1993 Title Artist, Warner Bros. T.V. Animation, Titles for: "Batman; Mask of the Phantasm", "Batman the Animated Series", "Sylvester and Tweety Mysteries", "Freakazoid!" and "Animaniacs"
1992 Prop Artist, Warner Bros. T.V. Animation, Props for: "Tazmania", "Animaniacs", "Pinky and the Brain" and "Tiny Toons Adventures"
1990 Background Layout Artist, Warner Bros. T.V. Animation, B.G.s for "Tazmania"
Guest Instructor, Art Center College of Design, Ringling School of Design and Directors Guild of America. Modo, 3d Studio Max, MAYA, Softimage XSI, Cinema 4D, Rhinoceros, Solid Works, AutoCAD, Lightwave, Adobe Photoshop, Adobe After Effects, Adobe GoLive, Ultimatte, Illustrator, AVID Media Composer (AVID Certified), Media 100, Final Cut Pro, Adobe Premiere, Bryce, Alias Auto Studio, Cambridge Animo, US Animation, Macromedia Flash and Dreamweaver, Word, Power Point, Excel, Painter I have, at various times, worked in Macintosh (OS 2 through X), Windows (NT, XP, XP Pro, 95, 98, 2000, 7) and UNIX environments in production and can manage hardware/ technical issues as well as the creative aspects of production. "Sam Plenty's Cavalcade of Action"
"The Best of the Best" Boating Magazine’s “The Best of the Best” for the Chris*Craft 252 Crowne. Designer, "The Worlds Largest Sport Fisher", Boat International, USA. Nominated to the U.S. Naval Academy, U.S. Air Force Academy and the U.S. Coast Guard Academy. Honorable Mention, National French Exams 1980,1981. Panelist, Producers Guild of America, New Media Conference, "Animation from Pencils to Pixels". 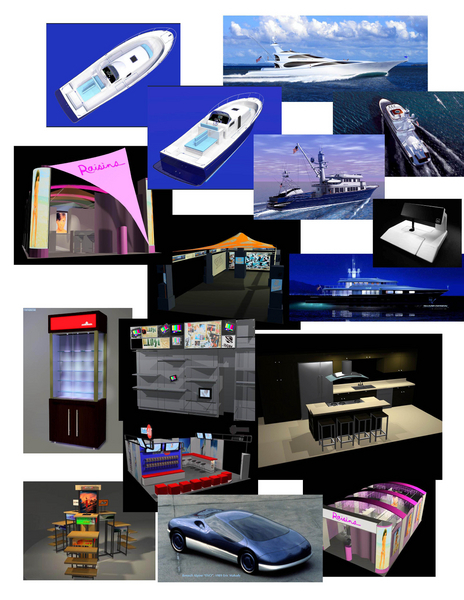 Industrial Design clients include:NASA, Chris*Craft, Régie National des Usines Renault, The Rivolta Group, Displayit, Sea Force IX, Sharp Naval Architects, Battaglia and Associates, Viking Yachts, Talon Marine, Boost Mobile, Raisins and Next.Production Design, Animation and Editing clients include:Walt Disney Animation, Warner Bros. Animation, Nickelodeon Animation, Film Roman, HBO, Universal Studios, The Jim Henson Company, Front Porch Entertainment, Paramount Studios, Omation, Toonz Animation India, PLC, The Discovery Channel, Brain Zoo, Saatchi and Saatchi, Gulf, UNICEF, Ford Motor Co. Kirin, Turner Network, Stargate/IDI, Tamara Bane Gallery, Robert Bane Editions, and “Dharma and Greg”.Instructor:Rhino for Yacht Design, Rhino for Jewelry Design, Industrial Design, Photoshop, Film Editing.Guest Instructor:Art Center College of Design, Ringling School of Design, Directors Guild of America, and Motion Picture Screen Cartoonist’s Guild.